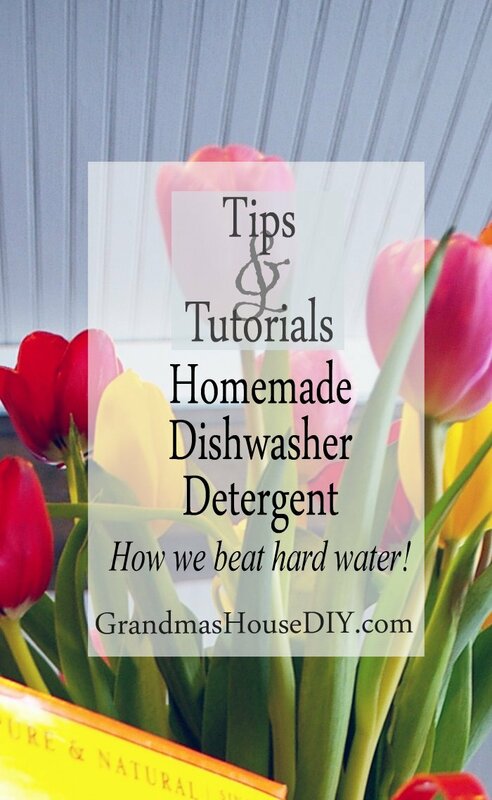 Homemade dishwasher detergent, how we beat hard water for mere cents! Over the years I’ve turned myself completely over to living and cleaning as naturally as possible in my home. For one it has saved us a ton of money and, for the other, I feel I am healthier for it. I went through several recipes I found online for homemade dishwasher detergent and settled on one that I just loved and use daily. The following recipe I picked up at Wellness Mama so I can’t take total credit for this one. However, when I moved into Grandma’s House it just wasn’t cutting it because I opted out of adding a water softener when I renovated this old farm house. I was also short on money so I decided to forgo the water softener and crossed my fingers and figured if I absolutely HAD to, I could always add one later. So, I moved in and then ran my first load of dishes and I was absolutely horrified! For those of you with hard water you already know what I’m talking about: my dishes were absolutely covered in white horror, they even FELT dirty. So then I panicked and tried everything and nothing helped. All those reviews on amazon about Lemi Shine had me really hopeful, my hard water laughed at it. And it all really bothered me because I hated that I wasn’t the one who was making it! So, I did a little more research, headed back to Wellness mama and spotted it “You can also add white vinegar as the rinse agent…” Of course!!! Duh!! So, instead of using my dishwasher’s little compartment for rinsing (I knew just looking at it that it wouldn’t be big enough for the amount of vinegar I was going to probably need) I just grabbed a little mason jar and filled it up halfway and put it in the top rack. The difference was absolutely amazing! After three loads with half a cup of vinegar added you couldn’t tell I had hard water anymore! 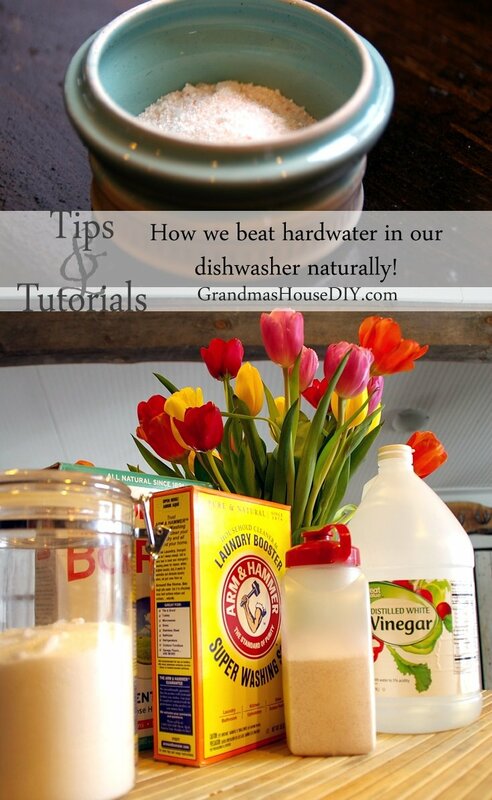 Between the vinegar and my homemade dishwasher detergent, I beat my hard water naturally! And, all in, the entire cost per load is around 10 cents! UPDATE: A few folks mentioned that there is a rather scary rumor going around that vinegar will somehow “destroy” your dishwasher. So, I did some serious research and found what I suspected: most of what you’ve heard has been blown entirely out of proportion. But, like most things, there is a seed of truth to this. The place in your dishwasher that is labeled for a “rinse agent” to be added, is not built to hold vinegar. This is where the rumors came from. Don’t put vinegar in the little spot that is meant for rinse agents, it is not meant for that! Instead, just put it in a little cup (right side up of course) in your top rack and you’re good to go! Hi, how much of this do you use or do you just fill the soap compartment? This sounds great! I don’t have hard water (municipal water) but I hate using all the chemicals. Silly question though – do you put the mason jar sitting upright in the top rack? How does the vinegar get mixed with the water for the rinse cycle? I might not have had enough caffeine yet so sorry if this is a dense question! Hello — How much of the dry mix do you put in your dishwasher? Do you always put vinegar in the load? If so, where and how much? Thanks. I fill the soap compartment up with the dry mix which translates to less then 2 tablespoons. The half a cup of vinegar I put in a jelly jar (a little Mason jar with a wide mouth) that I put right side up in the top rack. When the cycle is completed the jar is full of water and all the vinegar has been used. Thanks! I can’t seem to find citric acid – will it be affected to leave it out? I will let you know how it turns out… My water is very hard and my dishes look awful. Hi Mary, yes it will not work as well without Citric acid – you can order it on Amazon or go check out the canning area at your local grocery store and you should be able to find it no problem. Thanks! Does the salt have to be kosher salt? Hi Jen, I use Kosher salt that is a rougher grind (not so fine as regular table salt) and it seems to work a little better however I think it is just because it is not so fine so I don’t think it matters whether it is kosher or not. Thanks for stopping by! I have been making dishwasher pods but I do not think my dishes get as clean as store bought ones. And – they are expensive. So I am going to try this. No hard water but city that I do not like the taste of so will include vinegar, the miracle worker of our ancestor’s. Was doing the same for the washing machine. Now am on a liquid but for 4 gallons for that money shall be using your recipe also. Just a hint but I use fels napa soap for the washer. Grates and has no odor. Was making my own fabric softener but vinegar works for me. Thanks. This is not my beloved grandma’s house but I found one close to being hers and the house I grew up in in E. Cleveland via Oshkosh. A 1910 that everyday makes me feel I am home. Hi Jody! I posted about our laundry detergent too, we also use vinegar for fabric softener 🙂 For awhile I actually turned this powder recipe into pods by adding water, jamming the resulting wet “sand” into ice cube trays and then letting them dry for a couple of days. It worked ok but and I ended up just using it like this in powder form, a lot less work! I don’t yet! However, I would really suggest checking out http://wellnessmama.com/ because that website is awesome when it comes to making homemade soaps, detergents, etc. The “washing soda” called for in this recipe, would that be the same as the Arm & Hammer Super Washing Soda? You had me at hard water! Lol. I am definitely pinning this for later. Thank you! I hope it works as good for you as it did for us! Thanks for stopping by! Good recipe – I am familiar with Wellness Mama, she does have great recipes. I totally have hard water and it’s been driving me nuts! I just got some citric acid and will definitely need to give this a try. Pinned for later! Gina, let me know if it works for you! I almost gave up and figured we would just have to live with the white film! This worked SO well. No website. I live with my son & wife and I’ve shown her a lot of how=to’s ! She just shrugs them off. But, I’m hoping this will do it. They have city water but still get the “scale” deposits on glasses for sure.. But, I’d have to buy a small amount and just use it and then show her what it does. I am going to tell her about the rinse agent for clothes washing. They don’t use softners because my son is highly allergic to the scents. Some of them bother me as well. but I’m going to tell her about that. Thank you so much. Hey Helen, yes try this recipe, a lot of the commercial soaps and things really bother my skin but this recipe is so cheap and easy to make and it doesn’t bother my skin at all! I’m wondering if you know if it’s possible to adjust this recipe to use for bathing..Thanks for the recipe, hate the white residue! I’ve used vinegar for years for clothes but never thought to add to the dishwasher~it’s also a fantastic hair rinse, leaves my hair super soft and shiny! Hello Sue, I guess I never considered trying it for bathing but I would think you could certainly use it! The ingredients are gentle enough I would think I’d start off small for a full bathtub using maybe half a cup. Thanks! I live in Mexico and cannot find “Washing Soda”. Will ordinary baking soda work? Hi Kate, here is the link for super washing soda on Amazon: http://smile.amazon.com/dp/B0029XNTEU . And I can usually find it in our local grocery store hidden in the laundry aisle. However, if its not possible for you to get it like that, here is a link I just found on how to turn regular baking soda into super washing soda! I have not tried this myself but its coming from a good source: http://naturesnurtureblog.com/ttt-turn-baking-soda-into-washing-soda/ Hope that helps! Ooooh!!!! Can’t wait to try this!!! We have very hard water here in New Mexico. I have tried another “recipe” but it turned into a rock in the container! Have you noticed this happening with yours? I have all of the ingredients so am ready to try this. Thank you for all of this info! Hi Teresa! So far it hasn’t been a problem but I started using a courser salt (pink Himalayan salt I buy in bulk off of Amazon) so I’m thinking that might help in keeping it from clumping, I also have it in a water proof container that seals really well! Thanks for coming by! I have the hardest water ever – legit I checked with my local water provider – and I just may try this recipe. I also tried in vain with the Lemi Shine and such, just didn’t cut it. I use the overturned cup of vinegar once in awhile while running an empty load to clean out the dishwasher as well. Thanks for sharing this recipe, found you at Show and Tell! Hey Katie, this helped SO SO much! You almost can’t tell we have hard water using this recipe but, from time to time, I do still hand wash some of our dishes and I’m told its because of the hard water. Our white coffee cups, for example, did a scrub every now again because it just doesn’t seem to get the coffee stains out of them. I also soak the real bad pots after using them baking ,dried on cheese etc. just won’t come off. But I do wonder if that’s not a common problem for everyone lol regardless of hard water. Otherwise, my gosh, its hard to believe we have hard water when you see how clean our glasses come out 🙂 Thanks for coming by! It saves us a fortune! And it works great, thanks for coming by! Check out this week’s party – you’ve been featured! Thanks for joining the party! Oh Helen thank you so much!! I’d love to try to make this dishwasher detergent! i don’t think we have Borax in Europe, but I’m sure I’ll find a substitute! Katrin, yup there are substitutes out here I wonder if you can order it? Thanks!! This is such a great idea. I like the fact that overall it will help save someone money. Thanks for sharing his with SYC. Sounds like a great dishwasher detergent. I’m glad you found something that worked, we have hard water here too. Thanks for the tips. What a fantastic tip! 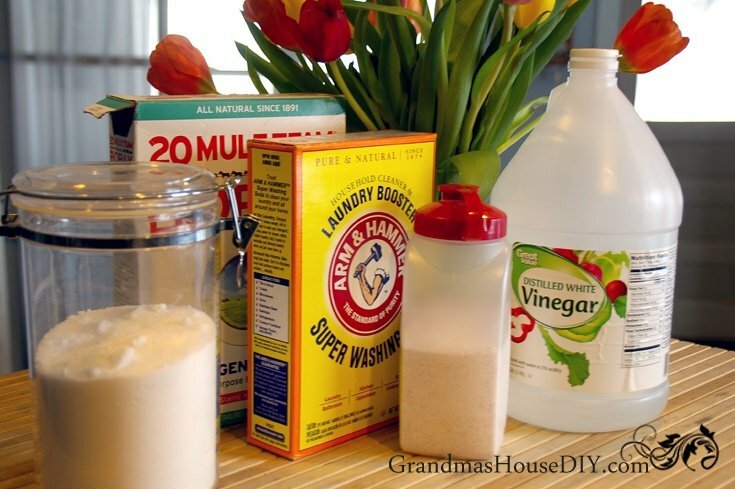 White vinegar has so many uses, and is also great for killing bacteria. Thanks so much for sharing at the #happynowlinkup! What a neat idea! I’ll have to try this! Yup, little by little we’ve gone all natural with just about everything. We still have all of our bathroom stuff to tackle, as soon as I finally run out of shampoo I’m switching to an all natural shampoo bar. I want to eventually try using vinegar as a rinse for conditioner but I haven’t had the courage yet! Yea!!!! We are about to buy a dishwasher and I planned on making a healthy detergent and now I have the recipe. I held out for years without a dishwasher and I can’t wait to join the modern world! Good article! Hey Diana, good for you! So far we’re really happy with our dishwasher detergent and I love that when I run out I just mix up another batch! I should try out this recipe! The last homemade one I tried didn’t work hardly at all. I’ve had a lot of success using baking soda and vinegar to clean my dishwasher so I could see the vinegar making a great rinse agent! Hey Pam, after some tweaking this recipe is what ended up working for us but it seems like everyone’s water is really different! Thanks for sharing! A few years back I tried a homemade dishwasher soap and it clouded my glassware. Does this do that? Hi Nartia, the key is the vinegar! That rinse is definitely what makes everything spotless but everyone’s water is different and that has a lot to do with it too! Thanks for coming by! I love your site. My husband & I, needing to cut back some are going to try your laundry detergent. I’ll be checking out your other money savers also. Awesome Janice! I hope it works as well for you as it had for us! Chiara I’m so happy to hear that! Do you put the full recipe in each load? Hi Fay, I use about 1/4 of a cup, just fill up the area in the dishwasher that calls for detergent! Thanks! We have terrible hard water. 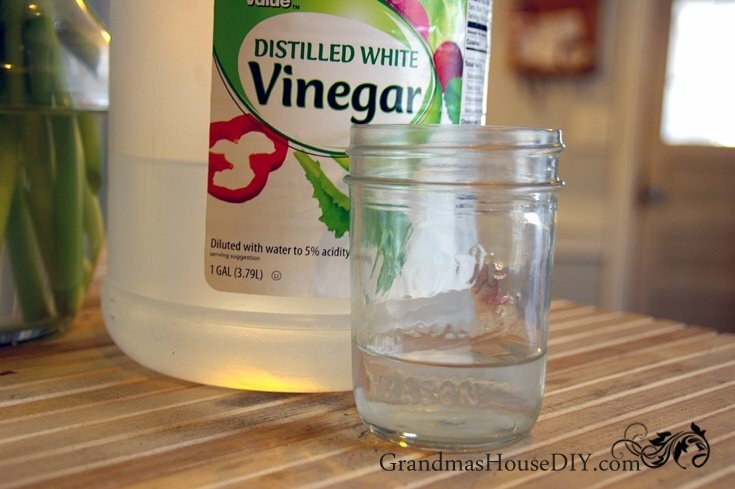 I use vinegar on a regular basis in our house just to clean the stains from everything. Hey Lindsay, truly with hard water vinegar is an absolute god send! Good idea… and thank you for the heads up on the vinegar in the rinse dispenser. Actually, w/ our big family, we rarely (maybe once or twice a year!) use the dishwasher… we just wash and dry by hand to get everything back in the cupboard (not in the dishwasher!) 🙂 Thank you for the recipe…. That’s great! Thanks for coming by and have a great weekend! Great idea and thx for the research on the vinegar in the rinse agent area. I have been loading it with white vinegar. The results have been wonderful but I’m sure it will rot something out that I won’t be happy about. New like from Coastal Bohemian . Found you at Homemade is Happiness. Thanks for coming by Michele, have a great week! Thanks! yes, i’m disappointed with Lemishine too – will try the vinegar trick today! Have a great week Sue! Thanks for coming by! I wish I had seen this at our last house. The water there was so hard. Thank you for sharing at Ravenwould. Thanks for coming by Kileen! P.S. This works really well on our old cast iron tub for hard water build up too! Hi there! I’m so glad to hear the recipe is working for you. Another thing to keep in mind is that not all dishwashers are created equal either. I have a brand new LG that I guess is just notorious for having problems draining and ended up with mold build up on the inside of it. I took it a part at one point and was just horrified. I had blamed myself because I thought it was hard water or my dishwasher soap recipe etc. It was neither of those things and just a common problem with my type of dishwasher. Now, about once a month, I run an empty load with a cup of bleach in a bowl in the bottom. Takes care of all of the problems!